Baking and I are not friends (unless a box of Funfetti is involved). Specks of flour sneakily inch into every kitchen corner and crevice, or I clumsily drop an entire bottle of vanilla into the batter whenever I bake. Usually more batter is on me than in the pan. 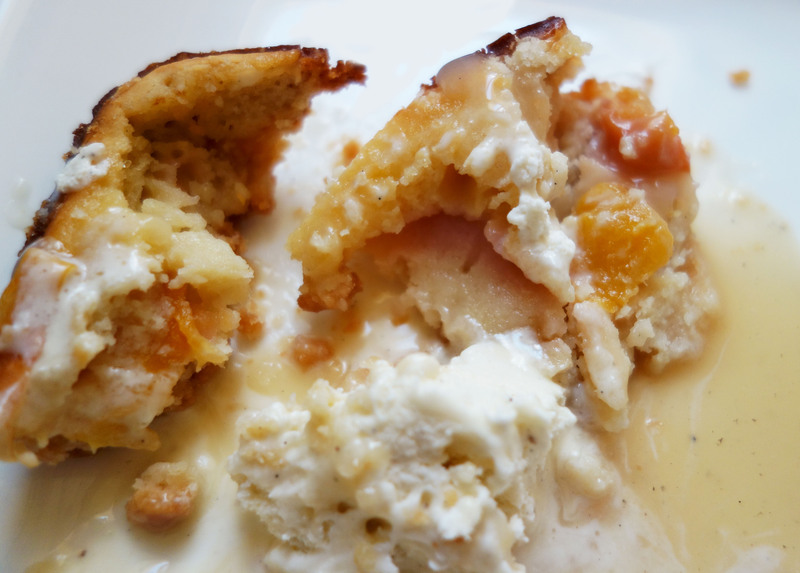 So, I was pleasantly surprised when these boozy peach bars came out quite tasty. Granted I spilled a whole bottle of pure vanilla extract all over the kitchen counter. I went to four grocery stores to find that stuff, FOUR! I also returned to the grocery store yet again, but let’s not talk about that. This decadent, soft dessert with fresh peaches is perfect for the end of summer. Happy baking! Combine 1 cup flour, salt & ½ cup sugar in a large bowl. Cut in butter with a fork into the dry mix until a grainy mixture forms. Press mixture into a greased 8×8 inch pan to form a crust. (P.S. reserve a little less than ¼ of the mixture to sprinkle on top at the end). Bake for 10 minutes. Meanwhile, make the best part – the peach filling! Combine egg, ½ cup sugar, Greek yogurt, vanilla, orange juice & flour. Whisk until smooth and stir in peach chunks. Pour peach mixture over the crust, top with remaining crust crumbles and bake 30-35 minutes until set. Wait until bars are completely cool before serving. While the bars are cooling, make this caramel bourbon sauce from Buzz Feed. It’s amazingly simple and deliciously boozy. Cut the bars into squares once cool. Top each serving with a scoop of vanilla ice cream and a generous drizzle of the caramel sauce. The other weekend I spent Saturday morning at the Socrates Sculpture Park Greenmarket. The market hosts a great selection of El Poblano Farm’s vegetables, bread from Artisan Oven Central Bakery and Red Jacket Orchard’s fresh juices. While browsing the local goods, you’re surrounded by a whimsy of sculptures and installations beneath the Manhattan skyline. It’s absolutely lovely! I picked up a few poblano chiles and couldn’t wait to make stuffed peppers for dinner. They may look like globby wads, but they’re cheesy, tasty globby wads. I hope you’ll agree! Roast peppers under broil for 7 – 10 minutes on each side. Remove from oven and let cool. Meanwhile, cook chicken, dice & add cream cheese & spices. Stir until blended. Mix in onion and black beans, then cover to keep warm. Slice each poblano pepper, making a slit down the center. Remove core and seeds (keep a few seeds if you like it spicy). Pour salsa on bottom of square baking dish. Scoop cream cheese/chicken mixture into the peppers. Place in the pan and top with cheese. Cover with aluminum foil and cook for 30 minutes at 350° until hot and bubbly.